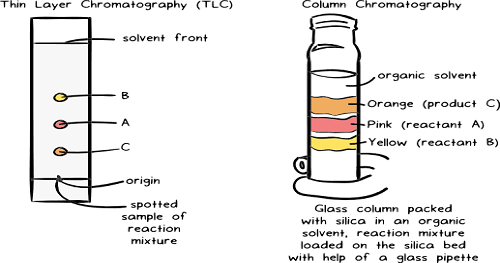 Chromatography: an analytical technique commonly used for separating a mixture of chemical substances into its individual components, so that the individual components can be thoroughly analyzed. . The mixture is dissolved in a fluid called the mobile phase, which carries it through a structure holding another material called the stationary phase. The various constituents of the mixture travel at different speeds, causing them to separate. The separation is based on differential partitioning between the mobile and stationary phases. Subtle differences in a compound's partition coefficient result in differential retention on the stationary phase and thus affect the separation.